Wordfest is bringing the indescribably brilliant Eileen Myles to Calgary for the first time. It’s your rare opportunity to experience a cultural force celebrated by the Paris Review, Rolling Stone and Vanity Fair. The renowned poet, novelist, public talker, and journalist will be presenting their latest poetry book called, Evolution, which has been called, “Chicken soup for the queer soul” by Ashley Tomaszewski of the Literati Bookstore. They will also be presenting their book, Afterglow: A Dog Memoir, about their relationship with their pit bull named Rosie. Hosted by Shelley Youngblut, this event includes an on-stage interview and audience Q&A, followed by a book signing. Cash bar available. 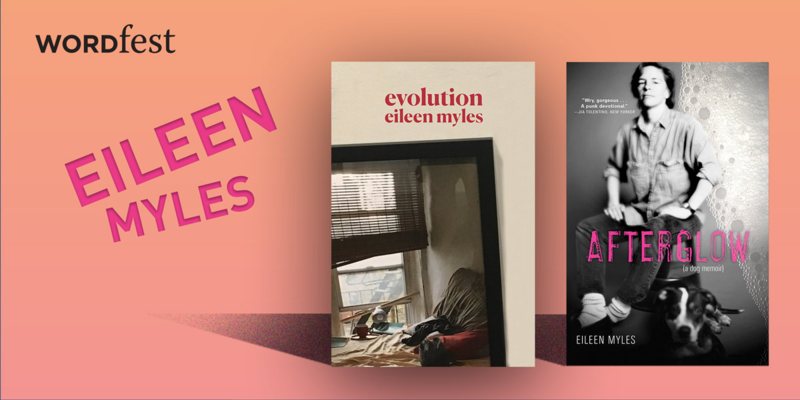 Prolific and widely renowned, Eileen Myles is a trailblazer whose decades of literary and artistic work “set a bar for openness, frankness, and variability few lives could ever match” (New York Review of Books). This newest book paints a kaleidoscopic portrait of a beloved confidant: the pit bull called Rosie. In 1990, Myles chose Rosie from a litter on the street, and their connection instantly became central to the writer’s life and work. During the course of their sixteen years together, Myles was madly devoted to the dog’s well-being, especially in her final days. Moving from an imaginary talk show where Rosie is interviewed by Myles’s childhood puppet to a critical reenactment of the night Rosie mated with another pit bull, from lyrical transcriptions of their walks to Rosie’s enlightened narration from the afterlife, Afterglow (a dog memoir) illuminates all that it can mean when we dedicate our existence to a dog.